Welcome to your one-stop resource for all things Griffith Real Estate! “The town that came to the tracks,” known today as Griffith, once boasted in the Guinness Book of World Records as being the town having the most baseball diamonds and for having the location where the most railroad tracks met at one point. It had been the railroads passing through town, heading to and from Chicago that kept the town alive for many years, lending stability to Griffith through the panic of 1893, and the Great Depression. Though there is only one remaining railroad traveling through town today, Griffith remains a vibrant community dedicated to the ideals of hard work and community learned from the past. Let the fantastic realtors with the Jana Caudill Team at RedKey Realty Leaders help you find your next dream home in Griffith. Freedom Park with its tennis courts and playground equipment is the ideal location for larger community gatherings. The Fall Harvest Craft Festival is run exclusively by parents, scout leaders, and scouts of the Griffith Boy Scout Troop 264. The festival features live band performances for your entertainment and showcases handmade arts and crafts exclusively. There you’ll find candles, ceramics, Christmas crafts, clothing, floral crafts, glass crafts, jewelry, mixed media, needlework, ornaments and more! Bridges Scoreboard Restaurant and Sports Bar is all sports, all the time. With 28 big screen hi-definition televisions and great food and drinks, you’ll never miss out on any of the action. The Erie Lackawanna Bike Trail was part of a national “rails to trails” program designed to take old railroad easements and repurpose them into bike and hiking trails for citizens. The trail promotes alternative modes of transportation and fitness in nature. Central Park features a war memorial to Griffith’s fallen veterans, a playground, sidewalks, and pavilion. Cheever Park features a young children’s playground, handball and tennis courts, and a softball field. According to City-Data.com the median household income for Griffith homes from a 2016 study shows an income of $58,614 compared to $52,314 for all of Indiana. 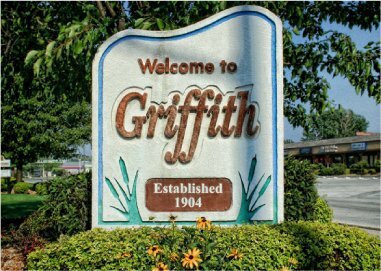 Median home values for Griffith in the same time frame were $143,694 compared to $134,800 for the rest of the state. For up to date information on homes available in Griffith visit these links or contact our office to set up an appointment. Hospitals and medical centers located near Griffith include Community Hospital, the Franciscan Physicians Hospital, and the Surgical Hospital of Munster, all three located in Munster, Indiana. Amtrak has three stations near Griffith: The Dyer, Sheffield Rd. station, the Hammond-Whiting station at 1135 Calumet Ave. in Hammond, and the Homewood station at 181 1st St & Park Ave. Colleges near Griffith are Purdue University Northwest in Hammond; Indiana University-Northwest in Gary; Ivy Tech Community College-Northwest, also in Gary; Prairie State College in Chicago Heights, Illinois; South Suburban College in South Holland, Illinois; City Colleges of Chicago-Olive-Harvey College in Chicago; and Chicago State University, also in Chicago. Whether you have a question on buying a home in Griffith, selling a home, or any other Griffith, Indiana Real Estate question please call or email us. We’re always happy to help!